Almost all content capture devices employ memory cards (flash-based removable media) for storage. Hand-held consoles and many other computing systems (PCs as well as smartphones) also employ them for augmenting the available storage capacity. There are different varieties of memory cards catering to various performance levels. CompactFlash (CF) became popular in the late 90s, but, has now been overtaken by Secure Digital (SD) and its smaller form-factor version (microSD). We recently started in-depth evaluation of the performance of various memory cards. FreeTail sent over their UHS-II microSDXC card for inclusion in our performance database. SD (Secure Digital) cards were introduced in 1999, as an update to the existing MultiMediaCards (MMCs). It gained traction even in areas where CompactFlash had been preferred, thanks to its small size. Its popularity is evident by the fact that it has spawned two follow-ups in the same form factor - starting with the SDSC in 1999 for capacities between 1MB and 2GB, we got SD High Capacity (SDHC) in 2006 (up to 32GB) and SD eXtended Capacity (SDXC) in 2009 (up to 2TB). The cards also come in various sizes - standard, mini, and micro. Along with the capacity, the performance has also seen an upward curve. While UHS-I had an upper theoretical limit of around 100 MBps, UHS-II added more pins and increased the theoretical limit to around 312 MBps. 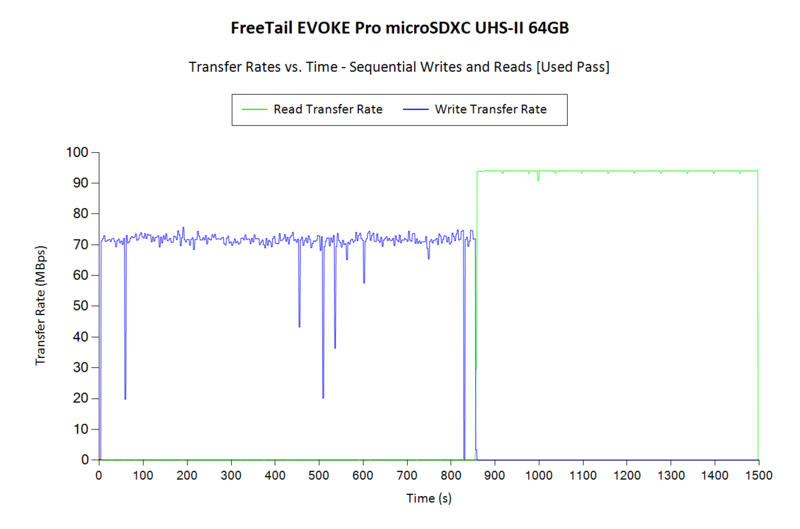 FreeTail's SDXC and microSDXC UHS-II/U3 lineup comes under the EVOKE Pro category. While the SDXC version has three members - 64GB, 128GB, and 256GB, the microSDXC set comes in at 32GB, 64GB, and 128GB. Today's review takes a look at the 64GB microSDXC version. Evaluation of memory cards is done on Windows with the testbed outlined in the table below. The USB 3.1 Type-C port enabled by the Intel Alpine Ridge controller connects to the Z170 PCH via a PCIe 3.0 x4 link. is used for benchmarking purposes on the testbed side. uSD cards utilize the Lexar Professional Workflow SR2 SDHC / SDXC UHS-II USB 3.0 Reader along with the microSD to SD adapter supplied by the card vendor. The reader was placed in the Lexar Professional Workflow HR2 hub and uplinked through its USB 3.0 port with the help of a USB 3.0 Type-A female to Type-C male cable. FreeTail claims speeds of up to 100 MBps, but real-world speeds are bound to be lower. In fact, writes can sometimes be much slower. For most applications, that really doesn't matter as long as the card is capable of sustaining the maximum possible rate at which the camera it is used in dumps data. We use fio workloads to emulate typical camera recording conditions. We run the workload on a fresh card, and also after simulating extended usage. Instantaneous bandwidth numbers are graphed. This gives an idea of performance consistency (whether there is appreciable degradation in performance as the amount of pre-existing data increases and / or the card is subject to wear and tear in terms of amount and type of NAND writes). Further justification and details of the testing parameters are available here. In its fresh state, the card meets the claimed numbers - around 100 MBps for reads, and writes in the 70 MBps region. This enables the card to meet the V60 requirements. However, after simulating extended usage, we find that the write performance becomes a bit unpredictable. Instantaneous speeds can fall to as low as 20 MBps before recovering. The reads remain rock-solid around 95 MBps. The AnandTech DAS Suite involves transferring large amounts of photos and videos to and from the storage device using robocopy. This is followed by selected workloads from PCMark 8's storage benchmark in order to evaluate scenarios such as importing media files directly into multimedia editing programs such as Adobe Photoshop. Details of these tests from the perspective of memory cards are available here. In this subsection, we deal with performance consistency while processing the robocopy segment. The graph below shows the read and write transfer rates to the memory card while the robocopy processes took place in the background. The data for writing to the card resides in a RAM drive in the testbed. The first three sets of writes and reads correspond to the photos suite. A small gap (for the transfer of the videos suite from the primary drive to the RAM drive) is followed by three sets for the next data set. Another small RAM-drive transfer gap is followed by three sets for the Blu-ray folder. The corresponding graphs for similar cards that we have evaluated before is available via the drop-down selection. Transferring lots of small-sized files may sometimes drop down the write rates to around 10 MBps. That behavior is seen across all the other UHS-II microSDXC cards that we have evaluated, and is nothing to worry about. 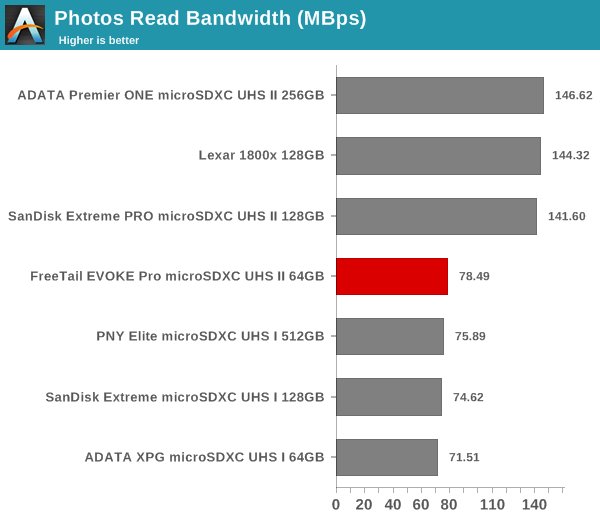 In terms of performance consistency, the FreeTail EVOKE Pro is better than the ADATA Premier ONE, but, not as good as the SanDisk Extreme PRO. The average transfer rates for each workload from the previous section is graphed below. 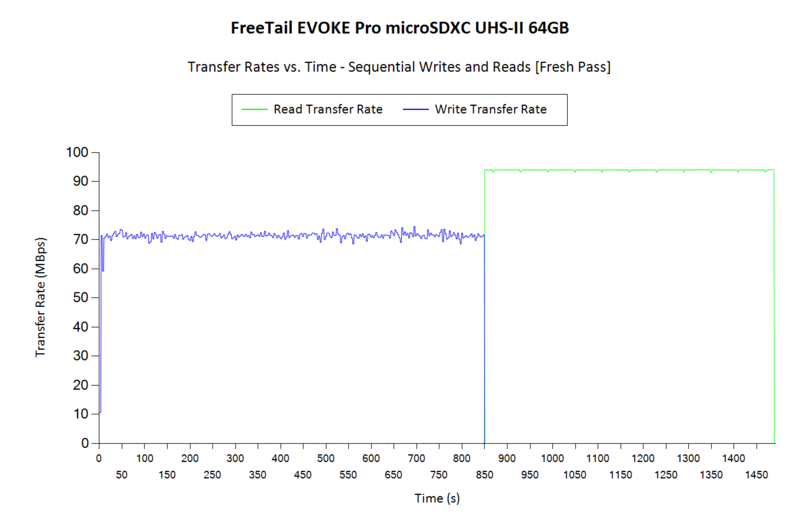 Readers can get a quantitative number to compare the FreeTail EVOKE Pro microSDXC UHS II 64GB uSD card against the ones that we have evaluated before. We also look at the PCMark 8 storage bench numbers in the graphs below. Note that the bandwidth number reported in the results don't involve idle time compression. Results might appear low, but that is part of the workload characteristic. Note that the same testbed is being used for all memory cards. Therefore, comparing the numbers for each trace should be possible across different cards. 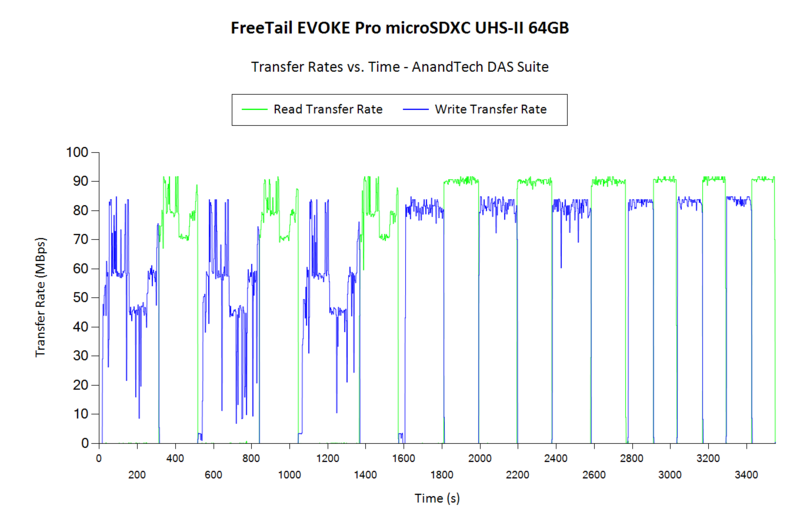 In both sets of performance graphs, we see that the FreeTail EVOKE Pro comes in the middle of the pack - better than the ADATA Premier ONE, but, not as good as the SanDisk Extreme PRO. The traditional memory card use-case is to delete the files on it after the import process is completed. Some prefer to format the card either using the PC, or, through the options available in the camera menu. The first option is not a great one, given that flash-based storage devices run into bandwidth issues if garbage collection (processes such as TRIM) is not run regularly. Different memory cards have different ways to bring them to a fresh state.Based on our experience, uSD cards have to be formatted using the SD Formatter tool from the SD Association (after all the partitions are removed using the 'clean' command in diskpart). In order to test out the effectiveness of the performance restoration process, we run the default sequential workloads in CrystalDiskMark before and after the formatting. Note that this is at the end of all our benchmark runs, and the card is in a used state at the beginning of the process. The corresponding screenshots for similar cards that we have evaluated before is available via the drop-down selection. Despite using the SD Formatter Tool, the write performance doesn't get back to the fresh state after a complete refresh. This is unlike the experience we had with the other microSDXC UHS-II cards. The read performance is unaffected, though. Our benchmark and consistency numbers have shown that the FreeTail EVOKE Pro UHS-II microSDXC card comes between the ADATA Premier ONE and the SanDisk Extreme PRO in terms of performance. In the long term, we would be wary of using it in content capture devices - maybe for a few months of heavy capture workloads would be fine. But, the consistency of the reads show that the card may hold promise for other workloads such as usage in the Nintendo Switch. We will need to look at the value proposition to make a final judgement on that. In addition to raw performance and consistency, pricing is also an important aspect. This is particularly important in the casual user and semi-professional markets, where the value for money metric often trumps benchmark numbers. 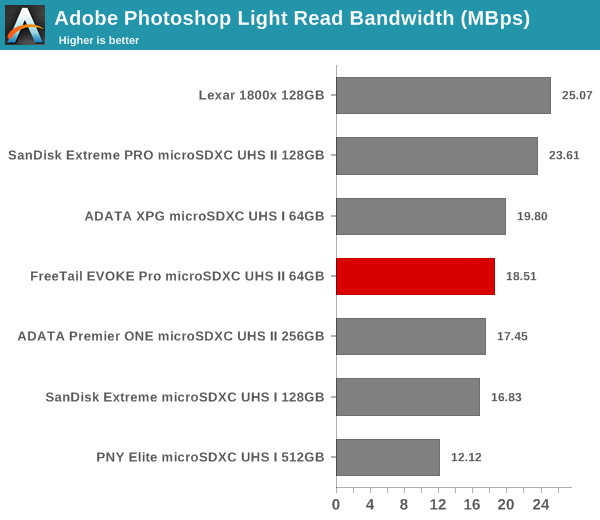 The table below presents the relevant data for the FreeTail EVOKE Pro microSDXC UHS II 64GB uSD card and other similar ones that we have evaluated before. The cards are ordered by the $/GB metric. The FreeTail EVOKE Pro is the cheapest UHS-II microSDXC card we have seen in the market. In terms of performance per dollar, the card is well-ahead of the competition. The only thing that prevents us from giving it an unqualified recommendation is the consistency of writes after extended usage. For read-heavy workloads such as usage in handheld gaming consoles, the FreeTail EVOKE Pro microSDXC UHS-II cards are a perfect fit. You can't just wipe it it start to end with zeros, like you do with an SSD that doesn't support TRIM? I'd point out that these cards have become fast enough and large enough (especially SD cards) that IF your computer supports UHS-II, it's kinda nice to just plug in a 500GB card and leave it there, as a "fast enough" extra 500GB of storage that's small enough that you barely notice it (ie rather smaller footprint than connecting a USB drive). How many computers support UHS-II though? Or are you just talking about laptops and NUC like devices? If so, then how many of those have the cards sunk in deep enough to not worry about it? I know a lot of my laptops had the cards sticking half way out, not really being an ideal solution to anything.